A little over a year and a half ago, I had featured a piece about our modern world so continuously elucidated by the visual impact of brilliantly devised manifestations of information graphics. In it, I vaguely recall having lamented over the nonchalant passing by of London travellers with respect to one diagrammatic wonder in particular: the indispensable TFL Underground map. More often adorned on tacky souvenir-shop undergarments rather than admired for the massive ease with which it allows Oyster Card carriers to get about town as best they can whilst avoiding congestion charge zones and bus routes sloth- and convulsion-prone, surely in this colour-coded map’s absence an already nightmarish logistical operation of daily tube service would be further exacerbated in levels of demoralizing pain as per experienced in rush hour commute, when the least you have to worry about is making sure you’re getting to where you actually want to go after having to change lines five times..? Which is why I was ecstatic upon hearing the news that Her Majesty’s postal service will soon be issuing a set of first class stamps to commemorate historic icons of British design. Because out of the ten monumental classics to be featured is the very inspiration behind ‘The Great Bear’ and many of the subway maps commonplace around the world. In the Royal Mail’s visual inauguration of the new year upon us, avid stamp collectors and designers are bound to appreciate this perforated, adhesive-backed look at history via the beautifully finished British Design Classics series. Launching the 2009 Special Stamp programme on 13th January, Britain’s finest are derived at large from the 20th Century style and engineering archives of the 1930s and 1960s, and will be featured alongside a ‘prestige stamp book’ providing extensive background and history of the designs. Included will be RJ Mitchell’s Spitfire fighter, George Carwardine’s angelpoise lamp, Edward Young’s jacket designs for Penguin books, Sir Giles Gilbert Scott’s extinct K2 model telephone box, Robin Day’s quintessential 60s polypropylene chair for Hille Seating, Mary Quant’s risqué (in its own time) miniskirt, the soon-to-be revived Routemaster bus — as well as Harry Beck’s map of the London Underground, of course. Perhaps the most obvious impact of British icons as demonstrated by this stamp series is that which British designers have had on transport vehicle engineering. 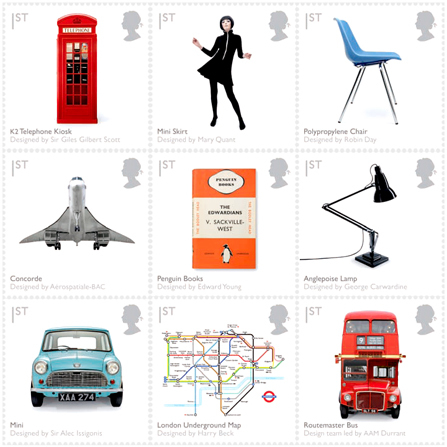 And to mark the Mini’s 50th and Concorde’s 40th birthdays, the Royal Mail will also be printing a generic sheet of twenty stamps (Mini series designed by Magpie; Concorde by Neon) and medal covers for each (designed by the Royal Mint Engraving Team). Enlisted by HGV to get involved with the project, photographer Jason Tozer shot alongside the team responsible for the images featured in the British Design Classics series. Working to receive the needed permissions from designers and their respective estates, they travelled to the national Motor Museum in Beaulieu to shoot one of the very first Minis manufactured, followed by trips to Stuttgart in Germany for the Concorde, a location in Surrey for the phone box, Acton transport museum for the double decker, and Hendon for the Spitfire. The remainder of the icons were shot in-studio, assuring that each was detailed in a manner true to the heritage of the designs, and soon was followed by exhaustive vetting for approval by the Royal Mail. Julietta Edgar, head of the special stamps division at the Royal Mail, stated that ‘special stamps mark unique moments, great anniversaries and vital cultural themes’. ‘Next year’s programme will take stamps further than before with a unique collection of fascinating images and subjects. For many, stamps are seen as one-inch square works of art, and we are confident that the 2009 stamp programme will live up to our customers’ expectations.’ And as the British postcode system celebrates its fiftieth anniversary this upcoming year by reviving its 1970s campaign to remind people of the importance of correct postcodes usage, what better incentive is there for accuracy than that added touch of classic British design to the corner of your envelope?